Discover the practical aspects of implementing deep-learning solutions using the rich Python ecosystem. This book bridges the gap between the academic state-of-the-art and the industry state-of-the-practice by introducing you to deep learning frameworks such as Keras, Theano, and Caffe. The practicalities of these frameworks is often acquired by practitioners by reading source code, manuals, and posting questions on community forums, which tends to be a slow and a painful process. Deep Learning with Python allows you to ramp up to such practical know-how in a short period of time and focus more on the domain, models, and algorithms. This book briefly covers the mathematical prerequisites and fundamentals of deep learning, making this book a good starting point for software developers who want to get started in deep learning. A brief survey of deep learning architectures is also included. Deep Learning with Python also introduces you to key concepts of automatic differentiation and GPU computation which, while not central to deep learning, are critical when it comes to conducting large scale experiments. 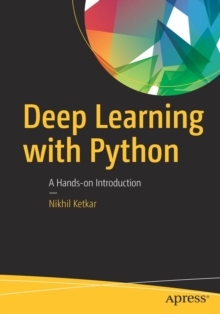 What You Will Learn Leverage deep learning frameworks in Python namely, Keras, Theano, and Caffe Gain the fundamentals of deep learning with mathematical prerequisites Discover the practical considerations of large scale experiments Take deep learning models to productionWho This Book Is ForSoftware developers who want to try out deep learning as a practical solution to a particular problem. Software developers in a data science team who want to take deep learning models developed by data scientists to production.